One of the newer research interests of Arnold Cassola is the field of demography, which includes onomastics. In recent years he has been patiently building the parts for a jigsaw puzzle that will cover the social relations between the people of Malta and Sicily: first we had Trapani (2011), then Pachino, Syracuse and Modica (2016), then again Trapani (2015), and now Vittoria and Scoglitti (2018). These towns are all in the south of Trinacria, west to east, the area which is closest to our island, and he will hopefully find the time to delve into other areas, possibly the larger cities like Catania, Messina and Palermo, and the smaller islands Pantelleria and Lampedusa. Migration between the two islands began in the Neolithic age and reached a high point under the Knights of St John, continued in the 19th century under the British and is by no means over now, thanks to intermarriage. The symbiosis was well known to Gian Francesco Abela, was reflected in a study led by Prof. Fr Andrew Vella in the early 1970s when a team of history graduands carried out research in parish registers of the 17th and 18th centuries; in the 1960s Bianca Fiorentini dwelt on the Italian exiles who came during the Risorgimento, and immigration is now being explored in detail by Simon Mercieca. In all these studies Sicilians feature in substantial numbers. The linguistic links have been explained in depth in chapters 3 to 6 of my Maltese and other Languages. A linguistic History of Malta (2011 and 2019), Sicilian surnames in Malta, modified or not, have been examined by Mario Cassar, and the genetic links are being analysed by Prof. Alex Felice and his team of specialists. 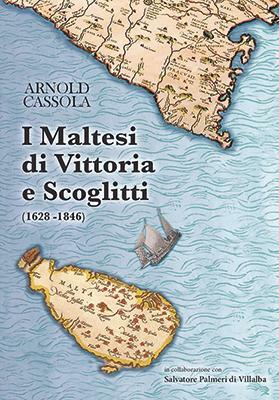 Cassola’s books give useful insights into the social phenome­non of migration, which has always intimately tied the two islands; suffice it to mention Pachino, a town founded in 1760: the king’s decree specified that half of the inhabitants had to be Maltese, and the reason was that with their experience they would help the growing of cotton. These books inevitably also give information in onomastics, thanks to the registration of names and surnames. First of all one notes a striking difference between the names in this book and those in the one about Trapani. In the latter, which focused on the years 1419 to 1455, most of the Maltese settlers were simply registered by their first name and the qualification Maltisi, de Malta or Maltensis. Only two persons are given surnames, Franciscus Furmusa and Manus Mallia, to which one might add Rogerius de Tabono and Simon de Zuppardo, still at an embryonic stage. The reason is that surnames only became standardised after the Council of Trent (1563) when the Church made birth, marriage and death registers compulsory in every parish and established their rules in 1614. The Maltese present in Vittoria and Scoglitti belong to a later age and a longer period (1628 to 1846), therefore most entries have a surname after their Christian name. However, parochial registers are not always remarkable for neat handwriting, nor for precision in spelling, because they were often hasty attempts at recording verbal utterances. As a result some Maltese surnames that were not common in Sicily, which we usually define as “Maltese” surnames (although Stanley Fiorini has shown that a good number of them were regis­tered in Sicily as early as the 11th or 12th century) appear in different spellings. Cases like the variants of Micallef as ‘Michalleff’, ‘Micalef’ and ‘Michalef’, and the rendering of Busuttil as ‘Busetei’ are to be expected because they were unfamiliar to whoever compiled the parish registers in question. The pronunciation of what was spoken by illiterate or semi-literate Maltese dialect speakers could not have been easy to transcribe for poorly educated parish priests or scribes. This would be the case of Birlò for Burlò, Breffi for Briffa, Librano for Lubrano, Pares for Paris, Zarafa for Zerafa, and Bezzini, Binzini, Bizzini, Pezzina and Vizzini for Bezzina (its origin is Vizzini, a small town near Catania). Dialect speakers in Maltese often pronounce vowels in an unclear manner (veru becomes vieriw, raġel becomes roġol, etc.). I haven’t come across a systema­tic explanation of these changes. A scribe who has learnt how to read and write Latin and perhaps Sicilian, and Italian from the 17th century onwards, would obviously need to add a final vowel to surnames that end in a consonant, or worse still in two consonants. This habit will explain forms like Borgi/Borgia, Zarbo/ Zarba, Mangione, Argiusa (for Agius), Causuni, Gatto. In some cases these would have restored the original Sicilian or Italian spelling, especially in Borgia, Mangione and Gatto. The same can be said of surnames that change gender, masculine to feminine, or the singular for the plural and vice-versa: Aquilino for Aquilina, Farrugio for Farrugia, Portello for Portelli may have been due to the unclear pronunciation of the final vowel (as schwa), which necessitates its reintegration to justify the accent on what in Maltese is the final syllable. Maltese often drops unstressed finals (karrozzìn for carrozzino, etc.) and this will shift the accent backwards for an Italian reader (in Italy they usually call me Brìncat, and I have to make the usual etymological explanations to justify Brincàt). Schembri may have dropped the unstressed median in Malta (compare tavla from tavola and paġna from pagina), or this a may have been added in Sicily to avoid the sequence of three consonants and facilitate its pronunciation as Schembari. It is not easy to decide where the surname originated when there are strong clusters in both Malta and Sicily, like Borg/Borgio, Camilleri, Farruggia/Farrugia, Zambito/Zammit. Other cases seem to be due to individual errors: for example ‘Bicales’ for Micallef first mixes the bilabials and then the s can be a wrong reading of the long s as f. We can see this also in ‘Bifaila’ for *Bisaila (Psaila). In this case we see another interpolation: the insertion of a vowel between two consonants which are rarely heard together in Romance languages: ps and bs (where b is unvoiced also in Maltese). Zapparresi mixes the labial plosive (p) and the fricative labio-dental (f). The insertion of epenthetic vowels in transcribing Maltese words is as old as the Cantilena that Pietro Caxaro wrote circa 1470, and is also common in Semitic place names transcribed by notaries in the late Middle Ages in both Malta and Sicily. Peculiarities can also mark Christian names: on page 17 question marks follow the names of “Zeylo (?) Bonello” and “Genny.mo (?) Camilleri”. The two proper names mentioned above seem to be approximate renderings of the Sicilian name Celu, or Celi (Cielo), which is an abbreviation of Michele, that has survived in the surname Miceli. The 13th century poet of the Scuola Siciliana, Cielo D’Alcamo, comes readily to mind. “Genny.mo” may have been an abbreviated scribble for Geronimo, with a lapsus calami or mistaken reading of r as n. Further mentions of the same persons in other documents could help their proper identification. Finally, the reader will be surprised at finding so many people with surnames that are manifestly Sicilian or Italian (as Cassola shows, quoting Enzo Caffarelli and Carla Marcato) that have never been registered in Malta. On page 74, Cassola traces no less than 31 such surnames: Aliotta, Bonino, Cannarella, Firrera, Gagliati, etc. They could have been Siciliani di ritorno, perhaps as second generation imports, giving more evidence of migration in both directions over short spans of time.